Waters says its new ACQUITY UPLC M-Class System is the industry’s first nano- to micro-scale ultra performance LC (UPLC) system rated for 15,000 psi operation. Coupled to the company’s mass spectrometers, the system delivers the sensitivity to quantify and to identify vanishingly small concentrations of key molecules. It is suited for a broad range of applications including proteomics, metabolic profiling, metabolite identification and pharmacokinetic studies. The new 15,000 psi-capable ACQUITY UPLC M-Class columns tap the potential of sub-two-micron particle technology, yielding faster separations, greater peak capacities and increased levels of sensitivity. "When scientists doing proteomics or investigating new biopharmaceuticals talk to us about the work they do, they often speak of protein coverage or being able to quantify and identify incredibly small amounts of key molecules usually in the presence of much higher amounts of other molecules. This is difficult work without the appropriate tools. With the ACQUITY UPLC M-Class System, they will have the capability to peer into the unseen and achieve their research goals," said Art Caputo, president of the Waters Division. "As an LC inlet to mass spectrometers, the ACQUITY UPLC M-Class System empowers more scientists to reliably employ micro-scale chromatography in order to solve their most complex analytical challenges." Nano- to micro-scale LC is defined by flow rates of 200 nl/min to 100 µl/min. with columns having an internal diameter of up to 1.0 mm. The advantages include the conservation of sample and solvent, increased sensitivity and a flow rate compatible with high sensitivity electrospray ionisation mass spectrometry. The latest innovation from Shimadzu Scientific Instruments is the Nexera Method Scouting System. 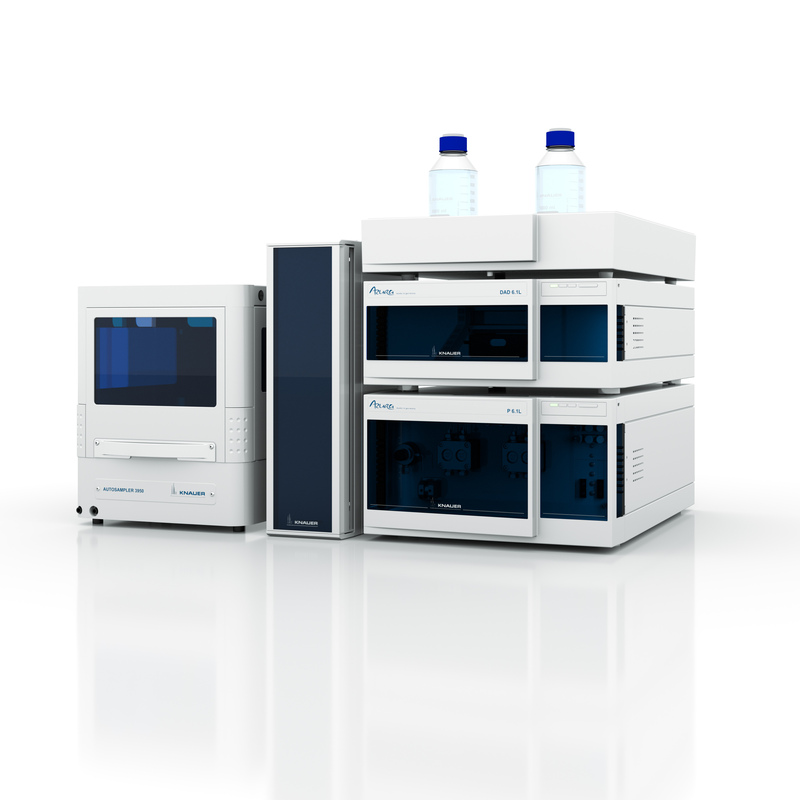 Capable of automatically investigating up to 96 combinations of mobile phases, gradients and columns, it significantly improves HPLC method development productivity in both R&D and QA/QC environments. The system is equipped with two pumps, each with a quaternary valve, which allows analysts to run binary gradients with 16 different solvent pairs. When combined with a robust high-pressure resistant column selection valve, which holds up to six conventional or UHPLC columns, the Nexera Method Scouting System can investigate up to 96 unique separation conditions per sample. A transfer programme allows ultra-high-speed conditions to be transferred to conventional conditions, making the system suitable for both R&D and QA/QC applications. Dedicated Method Scouting Solution software employs a graphical user interface and automated controls for simple creation of a scouting batch. It performs mobile phase purging and equilibration automatically for fast mobile phase switching and reliable data acquisition. In addition, scouting schemes can be prioritised based on laboratory policy. The system automatically calculates the required amount of each mobile phase to avoid shortages, and automatically controls upper pressure limits to eliminate column degradation during testing. In addition, it provides estimated completion times, allowing operators to conduct testing according to their work schedules. Meanwhile Knauer launched its new AZURA Analytical HPLC systems at Analytical 2014 in April. They are designed to provide versatile and reliable liquid chromatography solutions for high performance in routine analysis (Figure 1). Knauer points out the wide application range of these instruments which can also be used for purification tasks at flow rates up to 50 ml/min. The modern pump technology with features such as a pulsation compensated drive, selectable constant flow/constant pressure modes, and different gradient options provides very precise eluent supply for demanding HPLC applications. With an optimised flow path and a maximum pressure of 700 bar, the AZURA Analytical HPLC systems are said to be ideally suited for high resolution separations, for example with modern core-shell columns. Automatic piston seal flushing and RFID pump head recognition are convenient and useful features, as are leak detection, and tubing guides. The AZURA detection systems include the very sensitive diode array detector DAD 6.1L. A specialty of Knauer are the fibre optic versions of flow cells, which allow remote measurements in environments where operating a UV/Vis detector is otherwise impossible. The energy-efficient AZURA systems can be controlled by the software packages OpenLAB CDS EZChrom Edition and ClarityChrom. The instruments can also be equipped with an optional control unit for stand-alone operation. In a separate development, Knauer’s Contichrom System has won a top German innovation award. The Contichrom System is able to separate biomolecules such as therapeutic proteins in a much higher yield and purity than traditional liquid chromatography. The system recycles impure fractions that would otherwise be discarded until all desired components are isolated, increasing their yield by 50 per cent. Due to this automated process, the operator saves time and significantly reduces solvent consumption. Users can choose between five different modes of liquid chromatography – and so can select the best process for any separation. Finally, Thermo Fisher Scientific has introduced a new HPLC and UHPLC column, GlycanPac AXR-1, for glycan analysis. This new column offers extremely high-resolution separations based on charge, isomerism, and size and are designed to facilitate both high resolution glycan profile characterisation and quantification. The GlycanPac AXR-1 columns are designed for excellent resolution of labelled and unlabelled glycans, and are compatible with fluorescence and mass spectrometry detection methods. Superficially porous particles - commonly referred to as SPP or core-shell particles - have been proven to provide fast separations without the need for expensive ultra high performance liquid chromatography (UHPLC) instruments, thereby increasing sample throughput without capital investment. These particles feature a solid, impermeable core enveloped by a thin, porous layer of silica that decreases the diffusion path and reduces peak dispersion. As a result, they offer significantly higher efficiency than traditional fully porous particles of similar dimensions — often rivalling the efficiency of smaller particles. Now Restek says SPP core-shell technology has evolved with the introduction of its Raptor LC columns. Although column efficiency, which is boosted with superficially porous particles, considerably accelerates analysis time, it has little effect on resolution. Selectivity, on the other hand, has a substantial impact on resolution, but shows minimal improvement in analysis times. New Raptor LC columns bond rugged 2.7μm superficially porous particles with Restek’s ultra selective liquid chromatography (USLC) phases to offer chromatographers the best of both worlds. By being the first to combine the speed of SPP with the resolution of highly selective USLC technology, Restek says its Raptor LC columns provide the practicing analyst with the most powerful tools available for fast and efficient method development. It also says that Raptor LC columns are backed by the manufacturing and quality systems that the company is well known for – along with its high standards of service.